Every year, we hear tragic stories about a youngster playing with a gun and accidentally shooting a friend or him / herself. Often times these tragedies end up with a death. Regardless of how you feel about handgun ownership, the issue of safe storage is one that everyone should take seriously. Every gun owner should carefully consider the reasons for having a gun. If there is no compelling need to own a gun, remove it from your home. A gun increases, not decreases the danger to your family. If you own firearms, carefully consider where to keep them. Hall closets, nightstands, gun-lock drawers by the outside doors to your home and other traditional places are often where criminals, and curious children, look first. Store guns unloaded, locked up, and with a lock on the trigger. Consider a lock box for handguns. Store ammunition separately and locked up. 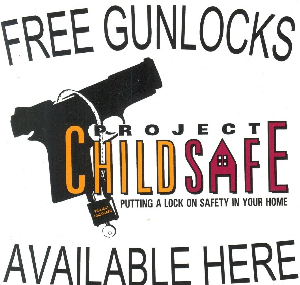 Highland Park residents may come to the station and request a free gun lock. Gun safes are a great idea and come in a variety of sizes. Many gun safes are have fire rating certifications and can serve to protect your firearms, important documents, and other valuables. If you or a family member are experiencing high levels of anger, fear or depression, remove guns from your home. It is during these times a gun is often used against a loved one or against oneself. Never handle a gun when under the influence of alcohol or drugs. Never leave a gun in your vehicle. Guns are often stolen from cars. Teach children to never touch a firearm without supervision, and to immediately tell an adult if they find a gun. Know where your firearms are at all times. You are accountable for them, and you are responsible for your gun not being used against a family member. All gun owners should receive training in the safe handling and care of their guns and ammunition. If you find a gun, call 911 immediately and an officer will be dispatched to pick it up. If you can do so safely, leave it where it is until the officer arrives. Safety is everyone’s business!